Growing up I always tuned in to this world-famous TV program from my early childhood years to my late teens. You may know it as “SportsCenter”. This flagship show has been the face of sports media for years as ESPN has run all but a monopoly in the sports media business. There seemed to be absolutely nothing that could halt their media dominance; this was, until the age of social media arrived. Sure, when smartphones were still in the process of emergence as the predominant way to do, well, everything, people still liked to get their daily dose of sports highlights and news from their television at the end of their work day, school day, whatever it was. And for some, that is most assuredly still the way to do things in a world where television is certainly still king. 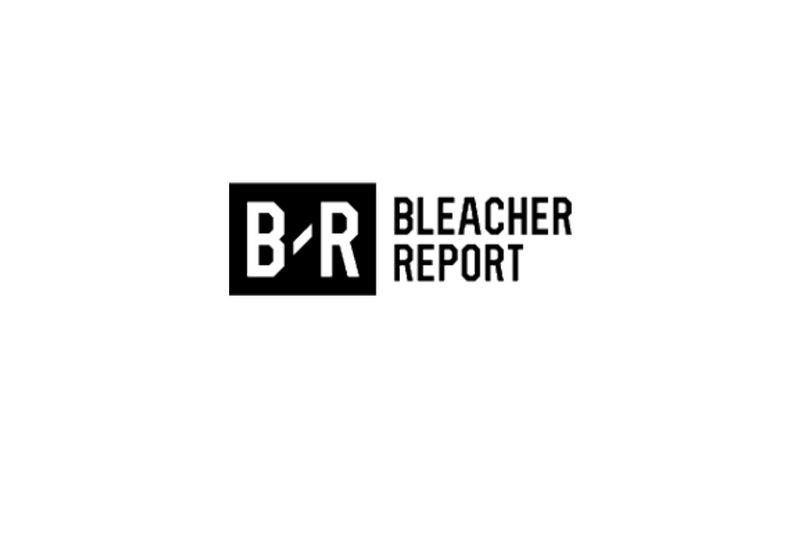 It wasn’t until Bleacher Report, a company that has actually existed since 2007, made it easier than ever for fans to access every highlight and piece of breaking news just by going to their favorite social media platform. Although ESPN is still the worldwide leader in pretty much every form of media, Bleacher Report has excelled on social media platforms. BR has been consistently solid in two things whilst engaging their social media audience that has set them apart: accessibility and identifying with the younger generation. While there is definitely no reason for ESPN to be shaking in their boots just yet, it is worth having a conversation about their long-term standing with younger audiences. On the surface we see a social media presence by ESPN that is contrary to the claims above. On the three major social media platforms, ESPN has more followers on each. It boasts 34.2 M followers on Twitter (compared to Bleacher’s 6.6 M), 10.1 M on Instagram (7.3 M for Bleacher), and around 18.3 on Facebook, compared to 7.4 M for BR. So why are we even having this conversation? If ESPN has more followers, they are winning the social media battle, right? According to an analysis of social media engagement and metrics done by CrowdTangle, the social media ‘money’is made in not followers, but engagement. Courtesy of CrowdTangle, this figure shows a different side to the social media story. 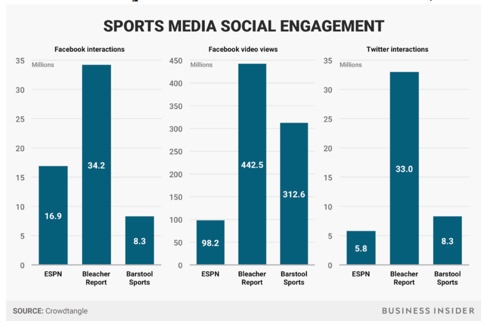 Amongst three major social media players (ESPN, BR, and a raunchier, college-style blog called Barstool Sports) in the sports world, we see that Bleacher Report leads social media engagement in every single category. The most notable statistic we can derive is the “Facebook Video Views” section. We see that BR boasted 442.5 video views on Facebook from 6/1/2017 to 9/1/2017. This metric is notable because in any form of media today, social media video is the single most explosive thing in digital media. That’s just the tip of the iceberg. 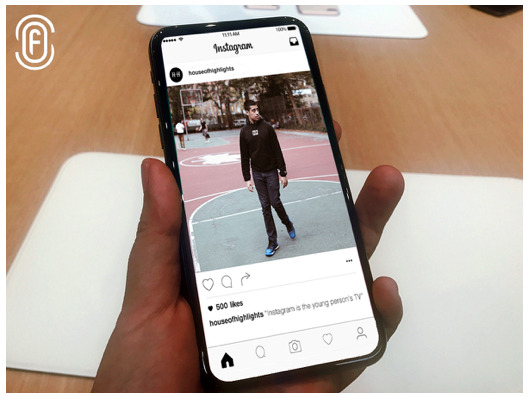 Instagram has emerged as the world’s most dominant visual media platform, and BR has taken to it better all of its competitors. “Our Instagram audience has blown up to a proportion we never imagined possible” said Bleacher Report CEO Dave Finnochio. “The engagement rate of posts on Instagram — meaning “Likes” or comments on videos — is way higher than it is on Facebook, Finocchio said. He pointed to House of Highlights, a BR-owned account with more than eight million followers, which has an engagement rate of “3 or 4%.””, the CEO continued. He also stated that the Facebook engagement standard for BR was already above average but included that Instagram’s engagement is “15 to 20x higher”. So why are BR’s engagement numbers so great compared to ESPN’s? It is easy to see once you compare the nature of their content. As a startup, BR can interact with their audience in a more casual, millennial fashion compared to an established, flagship company such as ESPN. 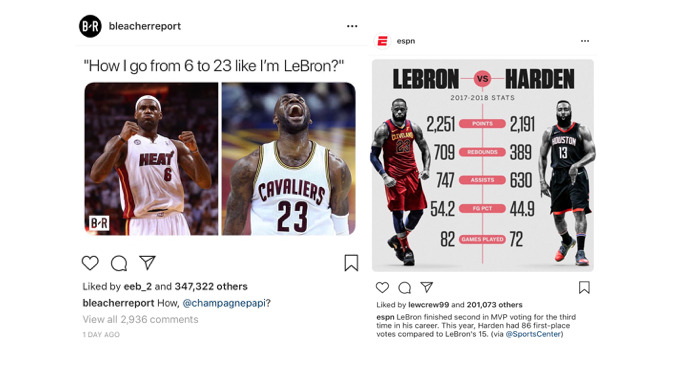 When you factor in the numbers and BR’s apparent social media savvy, it is clear ESPN may have a competitor with the younger audiences for years to come.